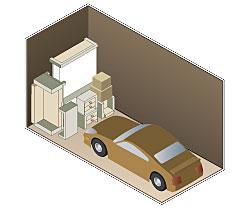 Sized for storing extra items such as a twin sized mattress set, seasonal items, clothing, books, bicycles, record file storage, boxes, etc. 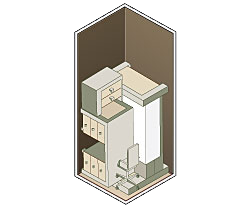 Can store one bedroom or one very small room of furniture or mattress set, sofa, dining room set or chest of drawers, boxes and small items. 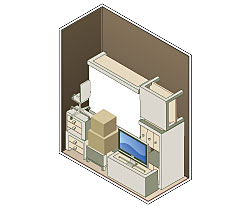 Can store one or two bedrooms or one small room of furniture or mattress set, sofa, dining room set or chest of drawers, boxes and small items. 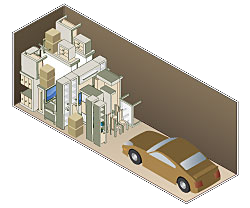 Can store one room of furniture or furnishings of one bedroom apartment without appliances or about 150 file boxes. 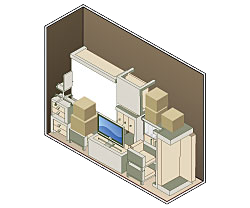 Can store one room of furniture or one bedroom apartment with refrigerator and washer/dryer, patio furniture, and many boxes or about 200 file boxes. Furnishings of three bedrooms or a two bedroom apartment or small house with appliances, patio furniture and many boxes or a vehicle or small boat OR building materials. 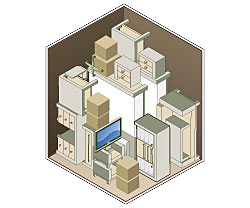 Furnishings of a two bedroom house with appliances, patio furnitures, and many boxes or a vehicle or small boat or construction equipment. Furnishings of a four bedroom house with appliances, patio furnitures, and many boxes or a vehicle or small boat or construction equipment. 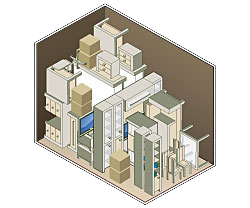 Furnishings of eight rooms of furniture or commercial or wholesale stoarage.